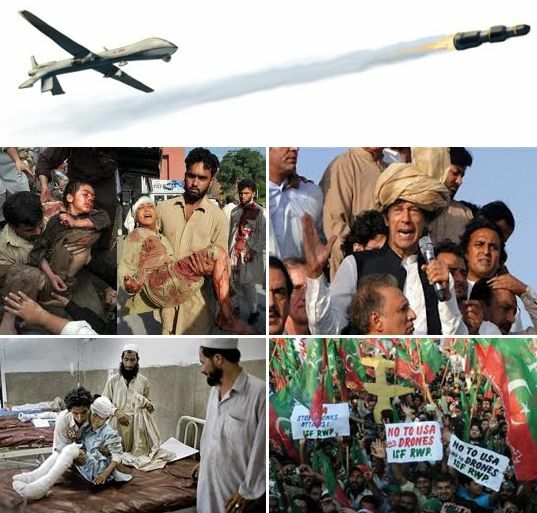 The US drone attacks continuing in some of the countries as part of the war on terror unleashed by the US, specially in Pakistan where over 30,000 thousands have perished sine 2004, mostly women and children, has attracted world criticism on this inhuman act and question the wisdom behind killing a few militants with a colossal collateral damage. Pakistan's emerging cricketer-turned-politician, the lone crusader against the drone attacks, has raised his voice against the drone attacks on many a fora around the world. However, recently a political analyst in an interview with Press TV has stated that the US assassination drone attacks amount to a “war crime” against civilians by a government that claims moral leadership of the world.